We saw plenty of work and action in Le Grand Bornand throughout the latter half of 2017, preparing for the winter 2017 – 2018 season ahead. This has resulted in some great improvements to the ski slopes and beginner’s area around the resort. 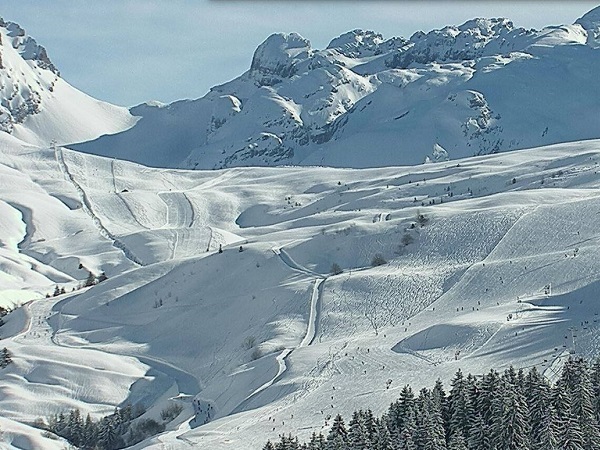 Your first impression when skiing in Le Grand Bornand is much improved with new cabines for the Rosay cable-car. They are bigger than before, now taking 10 people, and have comfy padded benches all the way around. They are also a much better height for kids, allowing them to have a more pleasant ride. 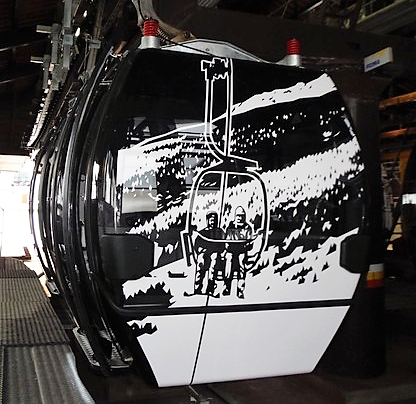 In addition they look great, each having been individually decorated by the local artist Pierre Moudry, with a typical scene of local mountain life, greatly enhancing your scenic journey to the base of the main Grand Bo slopes. And has anyone been lucky enough to ride in the sole golden cabine yet? 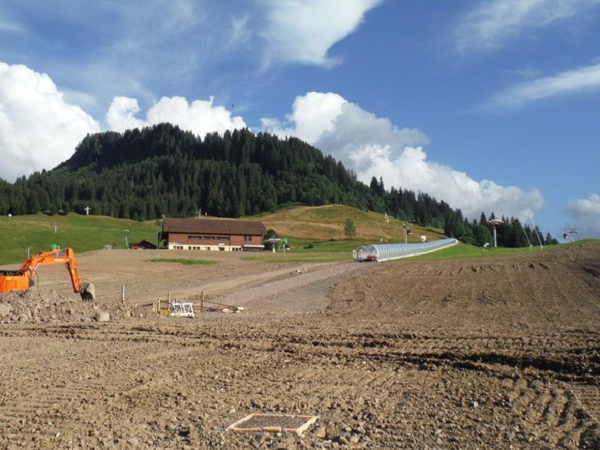 The beginner’s area at the top of Le Rosay telecabine has had a further regrading of the nursery slopes. 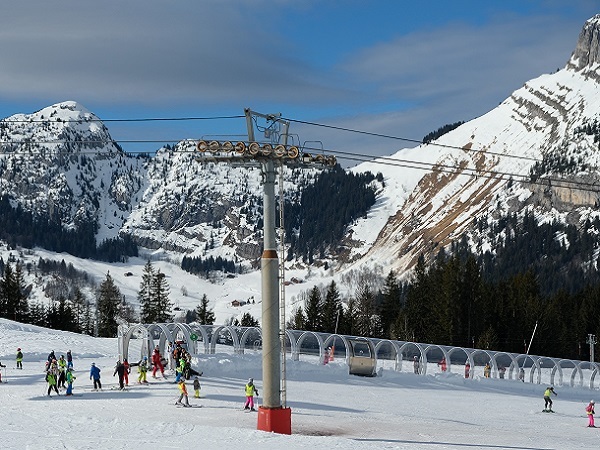 They have also extended the Magic Carpet lift – “Alpage Express” – taking it to 220m long, which is the longest covered wide carpet lift in Europe. It really does make Le Grand Bornand a perfect area for learners and novices, and is a great hit with the kids and ski instructors alike! Le Grand Bornand has a new red-piste from the top of Mont Lachat de Chatillon at 2,000m (the highest point of the resort), and the new Aiglon piste provides a great alternative to the “often mogully” Gypaete run. 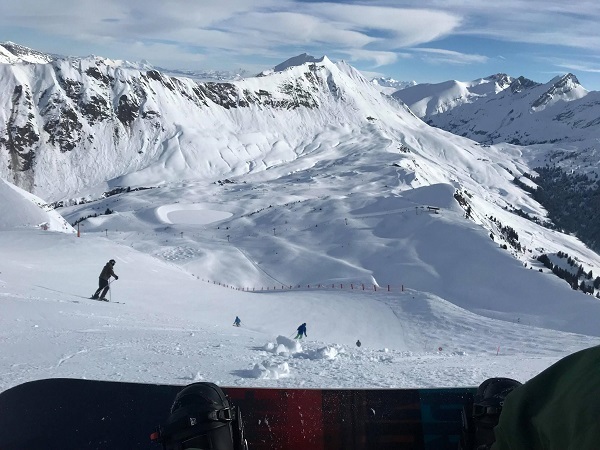 This year saw the new snow making facility in Maroly – a very popular ski area in Le Grand Bornand – come online at full capacity, which has boosted the capacity to make artificial snow to 2,800 cubic metres per hour. This means that approximately 50% of the piste can be made within 72 hours! Le Grand Bornand is an ideal location for a short ski break, not only in terms of skiing and facilities available, but also because it is only a 1 hour transfer from Geneva airport. All of our ski packages in Le Grand Bornand include half-board accommodation, airport transfers from Geneva during our standard transfer windows and your lift pass for the Aravis region ski domain which incorporates both Le Grand Bornand and La Clusaz.